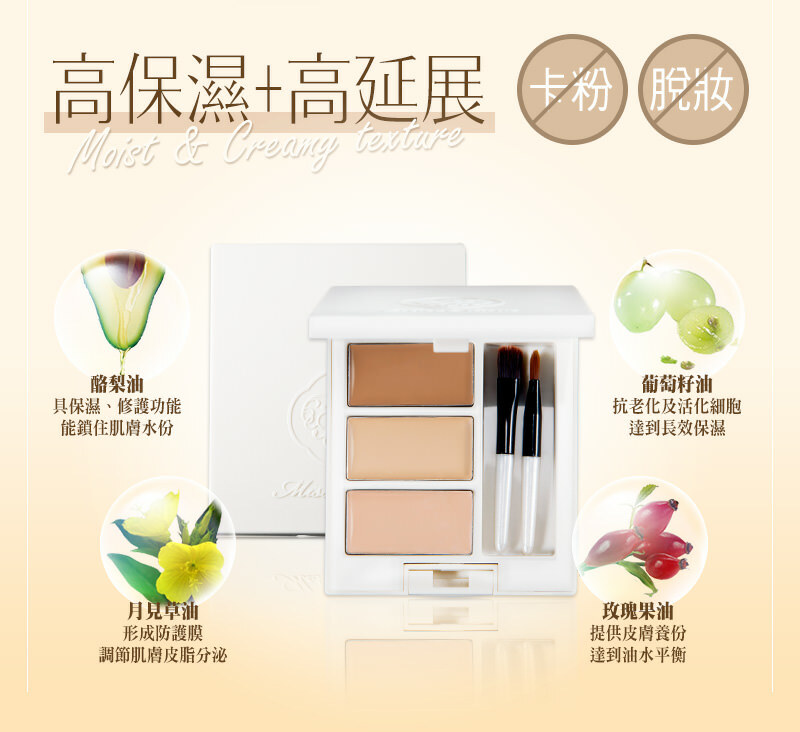 Three colors cream concealer palette, mix suitable color for your skin anytime. With a moist and creamy texture, used to mask dark circles and other blemishes visible on the skin. Bright skin around your eyes. Applying the perfect make-up. Caprylic/Capric Glycerides ' Titanium Dioxide, Dimethicone, Pentaerythrityl Tetraisostearate, Aluminum Starch Octenylsuccinate, Isodecyl Neopentanoate, Cetyl Lactate,?Synthetic Wax, Hydrogenated Coco-Glycerides, Silica, ?Theobroma Cacao (Cocoa) Seed Butter, Myristyl Myristate, Paraffin, Microcrystalline Wax, Phenoxyethanol, Caprylyl Glycol, Chloroxylenol, Persea Gratissima (Avocado) Oil, Vitis Vinifera (Grape) Seed Oil, Lauroyl Lysine, Stearyl Glycyrrhetinate, Helianthus Annuus (Sunflower) Seed Oil, Oryzanol, Rosa Eglentaria Seed Oil, Oenothera Biennis (Evening Primrose) Oil, Ironoxide Yellow CI-77492, Ironoxide Red CI-77491, Ironoxide Black CI-77499. Apply appropriate amount with brush and mix completely, then cover on blemishes or darkened skin on face. 1. Please keep in a dry and cool place that is out of the reach by children. 2. If feeling unwell of sensitive after use, please stop using immediately. Miss Hana Magnetic Illuminator (Con ..